It is a good Monday. Good Mondays seem like a rare occasion, but they do exist. Sometimes all it takes is setting good intentions, a little sweat sesh, and some strong coffee. All seems right with the world, and that’s rare for a Monday, so let’s celebrate it! I wanted to take a different angle for this week’s Meal Prep Monday! Instead of going through recipes, I wanted to give you a few tips that will work for anybody trying to eat well. In short, you could also call this post How To Make Healthy Food Taste Good. I always get asked about my lunches or dinners that I bring with me, and usually people say something like “that looks delicious!” rather than “I can’t believe you’re just eating seafood and veggies.” There are a few tricks to this trade folks. Here are a few of my favorites. 1. Know and love thy seasonings. Seriously, the saddest thing in the world to me is totally plain ANYTHING. Seasonings are good for you people! Even if you’re trying to watch your salt or sugar, there are a ton of natural seasonings that can add loads of flavor to even the most basic protein and vegetables. Think garlic, onion, (which you can use powdered or fresh) or fresh herbs. 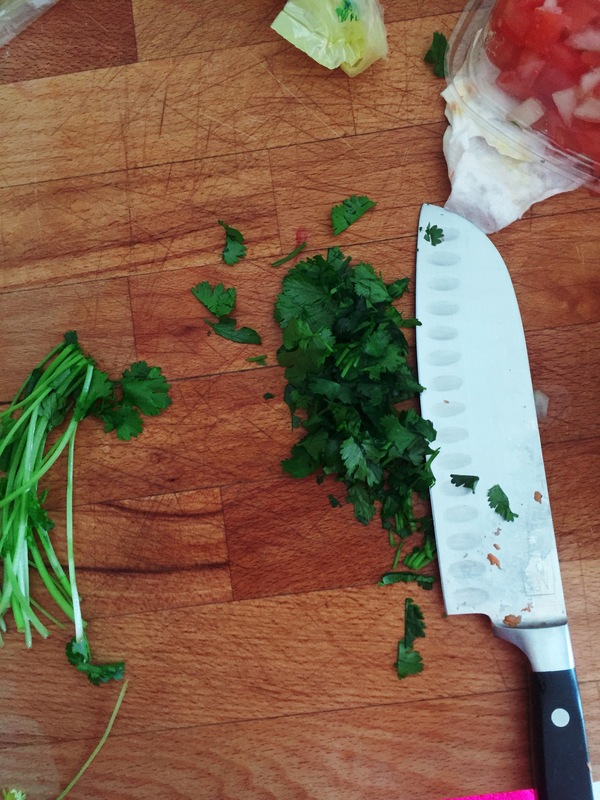 I’m obsessed with cilantro because of its bright and clean flavor. 2. Play with your textures. Zucchini? Boring. Zucchini noodles? Amazing. Apples? Alright. Apple chips? So cool! Mix it up when you’re preparing your fruits and vegetables. Sometimes all it takes to give a standby new life is a matter of perspective. 3. Recreate your favorites, the healthy way. You’d be surprised how many delicious-tasting, yet healthy versions of some of your favorite foods (pizza, pasta, doughnuts, and fries included) are out there. Of course they’re not going to taste exactly like McDonald’s fries, but all things considered, you usually end up feeling better with these healthier versions. One of my favorite bloggers out there is Minimalist Baker—she’s got healthier versions of just about all your favorites, all with 10 ingredients or less. Talk about an easy swap! 4. Invest in the good stuff. Eating healthy can be so much more fun when you see it as an investment in yourself! So treat yourself to a Whole Foods run or a trip to the farmer’s market. You can really taste the difference when you’re using just a few high-quality ingredients. Your mind and body will thank you! 5. Explore different flavor profiles. Here’s what I prepped this week, based on my two favorite kinds of cuisine: Mexican and Asian. I’ve got fajita-style veggies on the upper left and Asian-infused broccoli, asparagus, and cabbage next to it. (And of course, the sweet potato French fries are totally American). This way, I can switch it up during the week without being bored! I hope these tips are at least semi-helpful! When in doubt, reference Pinterest. Always reference Pinterest. Here’s to happier, healthier eating! Yup! Good stuff. I have an herb garden right below my kitchen window. My new favorite is pineapple thyme. Try it in sun tea instead of, or with, fresh mint which grows wild here in Arkansas.